DANNY FINGEROTH is a longtime comics professional. In addition to nearly two decades as a writer and editor for Marvel Comics, Danny writes book about topics related to comics and graphic novels and is considered an expert in comics writing, editing, and history. He has spoken about comics and their creators at venues including The Smithsonian Institution, The Metropolitan Museum of Art, and Columbia University. 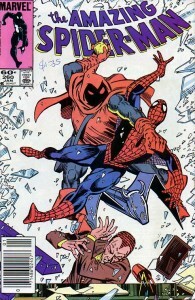 Danny was the longtime Group Editor of Marvel’s Spider-Man line and has written many comics including The Deadly Foes of Spider-Man limited series and the entire 50-issue run of Darkhawk. He was a consultant to the Fox Kids Spider-Man animated series and has written episodes of the 4Kids’ Teenage Mutant Ninja Turtles animated series. He has served as Editor-in-Chief of Byron Preiss’ Virtual Comics and as Sr. VP for Development at animation studio Visionary Media. 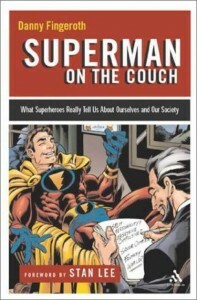 Danny is the author of the books Superman on the Couch: What Superheroes Really Tell Us About Ourselves and Our Society and Disguised as Clark Kent: Jews, Comics, and the Creation of the Superhero, both published by Continuum, and The Rough Guide to Graphic Novels, published by Penguin. He has written comics for the Harvey Pekar/Paul Buhle books Studs Turkel’s Working (The New Press) and the recent Yiddishkeit (Abrams). He was creator and editor-in-chief of Write Now! magazine, published by TwoMorrows, the leading publication about writing for comics and related media. The Best of Write Now! is available from TwoMorrows. He and Mike Manley have produced a book, How To Create Comics from Script to Print, and a DVD, How to Draw Comics from Script to Print, also from TwoMorrows. Write Now! lives on as a section of Manley’s Draw! magazine. Danny co-curated two recent acclaimed and crowd-gathering exhibitions at MoCCA: “Is This the Al Jaffee Art Exhibit?” (co-curated with Arie Kaplan), and “Will Eisner’s New York” (co-curated with Denis Kitchen). 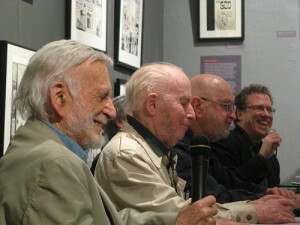 A March, 2011 MoCCA panel, featuring Jerry Robinson, Irwin Hasen, Jules Feiffer, Dan Makara (hidden), and Danny Fingeroth. Sadly, Jerry passed away in December, 2011. Photo by Gary Dunaier. Danny has spoken about comics at venues including The Smithsonian Institution, Columbia University, and The Metropolitan Museum of Art, as well as on NPR’s All Things Considered and NBC’s Today Show, and has written about them for publications including The Los Angeles Times and The Baltimore Sun. He has taught at The New School, NYU, the Media Bistro, and MoCCA. He is on the Board of Directors of The Institute for Comics Studies, and on the Board of Advisors of MoCCA. Danny has been an expert interview subject in many DVDs and documentaries, most notably The History Channel’s Batman Unmasked: The Psychology of The Dark Knight, also featured on The Dark Knight blu-ray DVD, and the upcoming PBS SUPERHEROES documentary series, directed by Michael Kantor (Comedy in America). He is an honors graduate of the legendary Cinema Department of Binghamton University, where he studied with Ken Jacobs, mentor to Maus creator Art Spiegelman. In the fall of 2011, The Stan Lee Universe, a book co-edited by Danny and Roy Thomas, was released by TwoMorrows. The book features lee-rarities including interviews from over the decades with and about Stan, articles about him from many eras, and many rarely and never-published artifacts of his life and career, including transcripts of 1960s-vintage radio programs (one co-featuring Jack Kirby) and other discoveries from The Stan Lee Archives at The University of Wyoming, as well as many amazing photographs and illustrations.